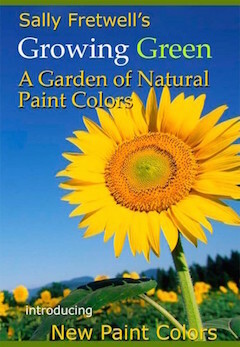 A Garden of Natural Paint Colors with New Paint Colors just recently developed. Nature provides us with all of the colors we will ever need. Find those colors that are the best for you and your circumstance and carefully match them to your paints. This book, “Growing Green” does exactly that. By showing you the natural tones and hues found in nature and producing your paint colors with my formulas the warmth and grandeur you are looking for can be achieved. Sally has developed hundreds of paint colors each with the special tones she was trying to acquire. This is no easy job as it takes hundreds of hours in some cases to acquire just the right shades for a particular circumstance. Our paint colors are like a bouquet of flowers that you can bring into your home or office to enliven and enrich it. We want to make picking paint colors easy and less stressful. This book offers pictures that exude warmth and natural beauty. I hope that in using these colors you will always relate them to the natural beauty from whence they came. When you buy our products it is not about just buying paint, it is about buying color. Sally Fretwell paint colors cannot only offer you and environmentally friendly, no VOC great paint but we are most proud of our warm, wonderful, and beautiful colors.